Despite the little stumble with NAMA foreclosing on the loans of a developer who is bessie mates with a certain political party in Northern Ireland, the hastily-issued NAMA promise to spend €11m developing 100 homes in that party’s stronghold appears to have had a placating effect. It just shows you how diplomatic you need to when dealing with certain people. Today, we have the report and accounts – available here – for PBN Property Limited for the year ended June 2012 in which the company heaps praise on the NAMA scheme, though also points out that NAMA hasn’t yet approved its business plan. PBN Property Limited is an important company in the PBN group, understood to be one of NAMA’s largest debtors in Northern Ireland, which is controlled by Paddy Kearney (“P”), Brian McConville (“B”) and former Anglo Northern Ireland boss, Neil Adair (“N”) though it is noteworthy that Neil resigned as a director of PBN Property Limited on 15th March 2013. The company had sales of GBP 7.9m (€9.5m) though racked up a loss of GBP 0.4m though interestingly there is no writedown on its property holdings. It has GBP 162m of property-related assets but is balance sheet insolvent to the tune of GBP 4m. It has 12 employees paid GBP 333,000 in total. PBN says today “the Directors welcome both the adventof this Irish government initiated bank asset relief agency which has both the time and resources to support the full exploitation of the Group’s asset base and NAMA’s responsible and measured approach to the property and construction industry in Northern Ireland” It also notes that it has submitted a “detailed” business plan to NAMA and that it continues to interact with NAMA to maximize the inherent long term economic value to be derived from the Group’s asset base. Contrast that approach to the one adopted in 2010 when PBN lambasted the Republic’s banks and lack of lending and support generally. Today of course PBN is in a straitened position with a small loss last year, an insolvent balance sheet and an audit opinion which is qualified for the not-unusual reason that it is nigh impossible to place a value on property assets at present. Still, no harm in being diplomatic. Remember the fear that NAMA was going to turn into a gravy train for professionals? Here’s the breakdown of the €21.68m of legal fees paid by the Agency in 2012. All aboard! NAMA says that the €21.68m comprises three distinct elements, there’s €3.28m which NAMA has charged to its own accounts for its own activities, there’s €0.68m in due diligence costs which NAMA expects to charge the banks and there’s an almost laughable €17.7m which NAMA says it hopes to recover from its developers. Top of the table is McCann Fitzgerald whose fees from NAMA topped €2m. 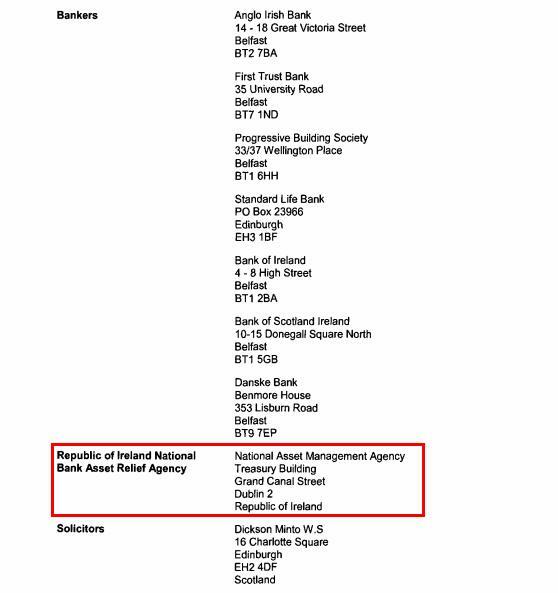 There are law firms all over the globe including McCarter and English, which was paid €221,000 and you’ll recall this is the US law firm engaged by NAMA in pursuit of Sean Dunne and his wife Gayle. NAMA has in the past assured us that it has a reasonable prospect of recovering the sums charged to the developers but with most developers severely under water, you’d have to be skeptical. And remember that whilst NAMA gets away with convincing its auditors that these sums chargeable to developers are really recoverable then NAMA is allowed keep these costs off its books so it doesn’t affect profit. There are firms from exotic locales like the British Virgin Islands, the Channel Islands and the Isle of Man as well as Asia and central Europe and in the UK, DLA Piper was paid €1,019,000 in 2012. NAMA paid two Dublin barristers almost €400,000 each (!) Paul Sreenan was paid €396,000. Here’s Paul at the Law Library having a little smile. 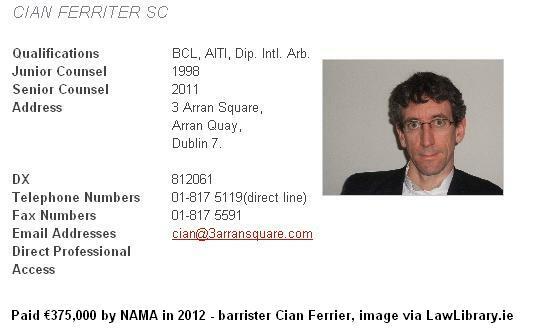 And a somewhat more serious Cian Ferriter who was only paid €375,000. The information was provided in a response to parliamentary question from the Sinn Fein finance spokesperson Pearse Doherty, by the Minister for Finance Michael Noonan. The PQ is available here, I’m not copying it below because of formatting issues. Hey world! If you want to see what a true “Nanny State” looks like, look at what Ireland has just done. The good news is that there is plenty of room in the rear of trucks and lorries going BACK into North Korea so if you hurry, you might just be able to escape to a less intrusive regime while there’s still time. The bad news is that today, Ireland enhances its reputation as a world laughing stock for its idiocratic public administration with the launch of personal insolvency rules that will see the State setting guidelines for personal expenditure on food, clothes, holidays, cars and in fact, will allow the State peer into every nook-and-cranny of your life. We might laugh at mass displays of boiler-suited communists marching in formation before a baby-faced despot, all with oversized hats and punching the air; they’ll be having a laugh at what we’ve just done. 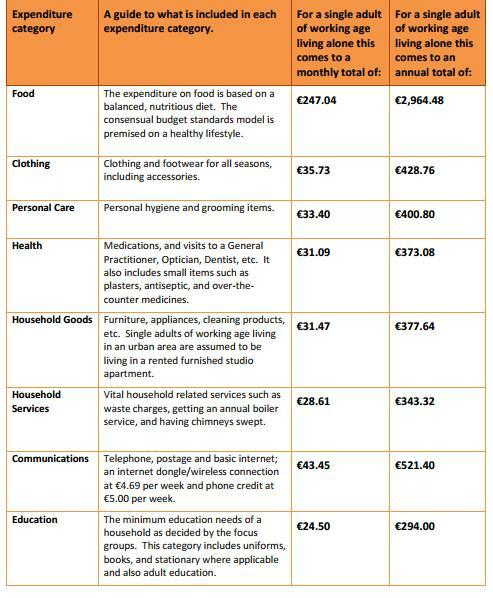 In North Korea they might punish citizens for not looking sad enough when a Dear Leader expires, in Ireland you’re allowed €28.97 per week for so-called “social inclusion activities”. Ireland has a colossal public and private debt problem. We have an economy that has slipped back into recession, a deficit of over 7%, unemployment of over 14%, emigration of over 80,000 per annum in a country of just 4.6m and the IMF are in keeping a daily watch over our finances. As a country, our gross debt:GDP is forecast to rise to 121% in 2013, our gross debt:GNP is over 140%. Private borrowing ballooned in the last decade partly to fund property acquisition and speculation, partly for consumer spending. The State has taken over most of the banking sector and is now, ultimately, the main creditor for many people. Now the economy has contracted by nearly 10% and the invoice has finally arrived in the post. And we can’t pay. Up to now, the only avenue available for heavily indebted citizens was a domestic bankruptcy which lasted 12 years and was practically unavailable. Or emigrate and file for bankruptcy elsewhere or live a half-life under the whip-hand of your creditors. At the end of 2012, we passed into law the Personal Insolvency Act which provides a more modern set of solutions, but the Act has not been commenced yet and won’t be until June. Today, we find out the detail of what the new Act will entail even if it will be another three months before anyone can actually use any of the new processes. The new quango, the Insolvency Service of Ireland has launched its website which provides detail on how the new solutions will work. What will have them rolling in the aisles internationally are the detailed rules on living expenses allowed during the insolvency period which is set between 12 months and 6 years. The guidelines are here. Here’s an extract. And yes, of course under “education” they couldn’t even spell “stationery”. The long-held view on here is that we import a template from an established democracy to allow quick and cheap bankruptcy which is in the interests of our economy generally, not to mention our society. What we have is going to be very expensive with a burgeoning personal insolvency industry and most heavily indebted people will still be better off emigrating. The level of intrusion into peoples’ lives for between 1-6 years is world-beating. It is truly remarkable that more than two months after the special liquidation of Irish Bank Resolution Corporation that the smoke is only now beginning to clear on some very important aspects of the liquidation. In February 2013, Minister Noonan directed NAMA to buy IBRC debt at the Central Bank and NAMA issued €15bn of state guaranteed bonds to buy the charge over €15bn of IBRC assets held at the Central Bank. 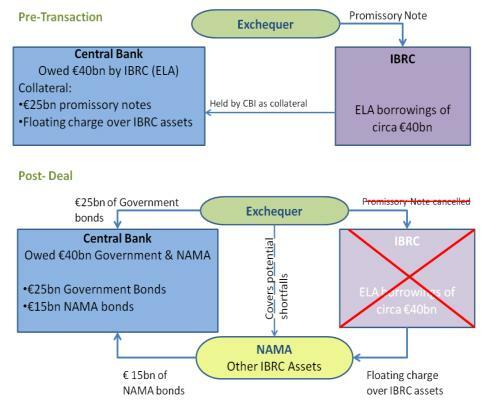 Here is the IMF schematic of the IBRC liquidation. So, it is now NAMA that is exposed to losses on these bonds, and the estimate on here is that IBRC’s assets were worth €1-3bn less than their book values in February 2013. This is beginning to look maverick, ah-hoc despite being planned since last October 2012 and amateurish, and worse, Minister Noonan refuses to provide us with the meat of the NAMA directions. But what we do know, is that bondholders covered by the ELG are being paid €933m ahead of NAMA which we own – according to the March Exchequer Statement, €933m was provided to IBRC by the Government on our behalf in March 2013. The full parliamentary questions and response are below (with my emphasis added) and available at the Oireachtas website here. Deputy Stephen S. Donnelly the total value of Irish pension funds on deposit, or in any other financial product, on the books of the Irish Bank Resolution Corporation at the time of liquidation under the Irish Bank Resolution Corporation Bill 2013; and if he will make a statement on the matter. Deputy Stephen S. Donnelly the total write-down in the value of Irish pension funds due to the liquidation of the Irish Bank Resolution Corporation under the Irish Bank Resolution Corporation Bill 2013; and if he will make a statement on the matter. Deputy Stephen S. Donnelly the number of individual pension funds, that is persons, affected by the liquidation of the Irish Bank Resolution Corporation under the Irish Bank Resolution Corporation Bill 2013; and if he will make a statement on the matter. Minister for Finance, Michael Noonan: I propose to take Questions Nos. 275 to 278, inclusive, together. As the Deputy is aware, I am not in a position to advise on the specifics of any accounts with IBRC (in liquidation). I have been informed that there are a number of customer accounts that may not be entitled to full compensation under the deposit guarantee scheme, DGS, or the eligible liabilities guarantee scheme, ELG, due to the nature of the products or deposit options in which those account holders invested. At the time that such products were offered there was no additional guarantee provided by the State in respect of those products. It was always the case that the ELG scheme covered only those liabilities which were entered into during the issuance window. I have been advised that the total value of Irish pension funds placed on deposit with Irish Bank Resolution Corporation at the time of liquidation was in the region of €1m. This could exclude any funds placed on deposit with the Bank in client accounts opened on behalf of beneficiaries, where these beneficiaries are Irish pension funds. The total value of Irish pension fund deposits is currently under review with the respective Guarantee Scheme Operators, regarding consideration for payment under the respective schemes. The total number of individual pension funds with funds placed on deposit with Irish Bank Resolution Corporation at the time of liquidation was 23. Again, this could exclude any pension funds who are the beneficiaries of client accounts opened on their behalf. Through the liquidation process, the proceeds from the disposal of IBRC’s assets will be used to repay creditors in accordance with normal Companies Acts priorities and consequently, preferred creditors will be paid first and then debt purchased by NAMA from the Central Bank will be paid. If there are proceeds available after repayment in full of the NAMA debt, these proceeds will be applied to remaining unsecured creditors. This would include depositors to the extent that their deposits are unguaranteed.